Connecticut floor mounted manual bending brakes are precision machines designed for accurate bending with rated capacities. All Connecticut bending brakes have positive clamping pressure adjustment, apron stop rods for repeat bends, long handles for extra leverage, work support angle bar for full capacity 1-inch minimum flange, Improved leg design for lighter weight, all steel construction – no castings, heavy tie rods for minimum deflection, removable bending bar and angle, adjustable apron hinges and a positive rear material gauge adjustment. Connecticut Series hand brakes are an economically-priced solution for your bending needs and will provide years of trouble-free service. 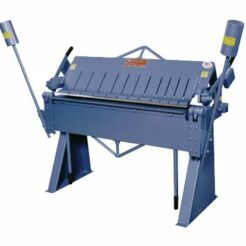 This machine has a bending capacity of 16 gauge up to 8 feet long. Connecticut floor mounted manual bending brakes are precision machines designed for accurate bending with rated capacities. All Connecticut bending brakes have positive clamping pressure adjustment, apron stop rods for repeat bends, long handles for extra leverage, work support angle bar for full capacity 1-inch minimum flange, Improved leg design for lighter weight, all steel construction – no castings, heavy tie rods for minimum deflection, removable bending bar and angle, adjustable apron hinges and a positive rear material gauge adjustment. Connecticut Series hand brakes are an economically-priced solution for your bending needs and will provide years of trouble-free service. This machine has a bending capacity of 16 gauge up to 10 feet long. Connecticut floor mounted manual bending brakes are precision machines designed for accurate bending with rated capacities. All Connecticut bending brakes have positive clamping pressure adjustment, apron stop rods for repeat bends, long handles for extra leverage, work support angle bar for full capacity 1-inch minimum flange, Improved leg design for lighter weight, all steel construction – no castings, heavy tie rods for minimum deflection, removable bending bar and angle, adjustable apron hinges and a positive rear material gauge adjustment. Connecticut Series hand brakes are an economically-priced solution for your bending needs and will provide years of trouble-free service. 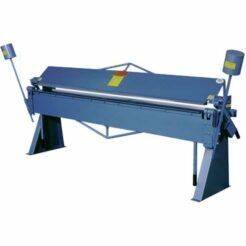 This machine has a bending capacity of 18 gauge up to 10 feet long. Connecticut floor mounted manual bending brakes are precision machines designed for accurate bending within rated capacities. Features of the Connecticut box and pan bending brake are a 6-inch depth of box capacity, 6 feet of 16 gauge bending capacity, positive clamping pressure adjustment, apron stop rod for repeat bends, replaceable bushings and hinge pins, long handles for extra leverage, work support angle bar for full capacity 1-inch minimum flange, improved leg design for lighter weight, all steel construction with no castings, heavy tie rods for minimum deflection, removable bending bar and angle, adjustable apron hinges and positive rear material gauge adjustment. Connecticut Series box and pan brakes are an economically-priced solution for your bending needs and will provide years of trouble-free service. Connecticut floor mounted manual bending brakes are precision machines designed for accurate bending within rated capacities. Features of the Connecticut box and pan bending brake are a 6-inch depth of box capacity, 4 feet of 12 gauge bending capacity, positive clamping pressure adjustment, apron stop rod for repeat bends, replaceable bushings and hinge pins, long handles for extra leverage, work support angle bar for full capacity 1-inch minimum flange, improved leg design for lighter weight, all steel construction – no castings, heavy tie rods for minimum deflection, removable bending bar and angle, adjustable apron hinges and positive rear material gauge adjustment. Connecticut Series box and pan brakes are an economically-priced solution for your bending needs and will provide years of trouble-free service. *Lead times may be longer for this item.